AkronCanton Airport (IATA: CAK, ICAO: KCAK, FAA LID: CAK) is a commercial airport in the city of Green, in southern Summit County, Ohio (a small piece of each runway is in Stark County), about 14 miles (23 km) southeast of Akron and 10 miles (16 km) northwest of Canton. It is jointly operated by Summit County and Stark County. 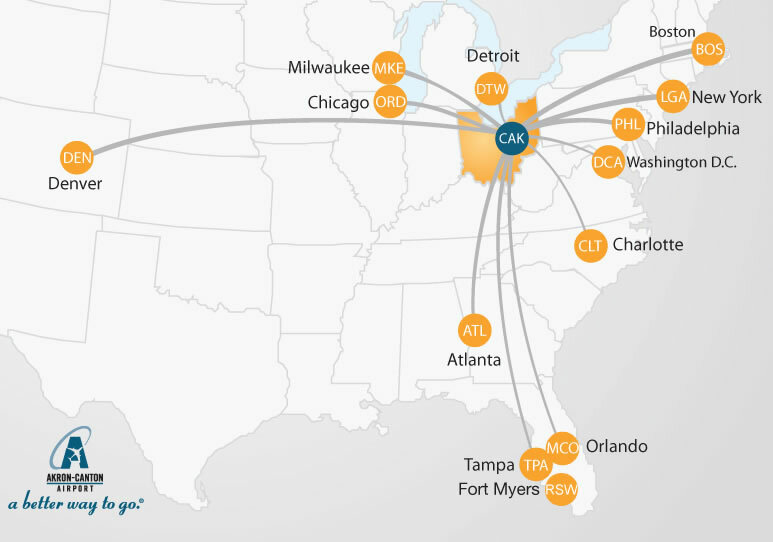 The airport is a "reliever" airport for Northeast Ohio and markets itself as "A better way to go", emphasizing the ease of travel in comparison to Cleveland Hopkins International Airport. Over 75% of its traffic is general aviation. The airport was dedicated on October 13, 1946, as the AkronCantonMassillon Airport; the name was later changed to AkronCanton Regional Airport. Passenger air service began in 1948 when American, United, Capital, and Eastern airlines moved from the Akron Fulton International Airport. The airport initiated CAK 2018, its 10-year, $110 million Capital Improvement Plan in March 2008. The plan is the most ambitious capital improvement plan in AkronCanton Airport's history and calls for 10 projects in the next 10 years. One of those projects, a runway expansion, has already been completed. Runway 5/23 was extended from 7,600 ft (2,300 m) to 8,200 ft (2,500 m). The runways will allow aircraft to fly non-stop to anywhere in the U.S. and throughout Mexico and Canada. AkronCanton Airport has a number of taxicab and shuttle services. This article based on this article: Akron-Canton_Regional_Airport from the free encyclopedia Wikipedia and work with the GNU Free Documentation License. In Wikipedia is this list of the authors .